Upon selecting the "edit mapping" button you will be able to create new mappings by "Add Mapping" or edit existing ones. Once a mapping has been created, you can now use it within the template editor by clicking on the pencil icon, just as before within the data source section to specify the mapping you wish to use. View Mapping - Upon selecting this button you will be able to see each the dimension(s) and metric(s) that this mapping contains and its attributes. 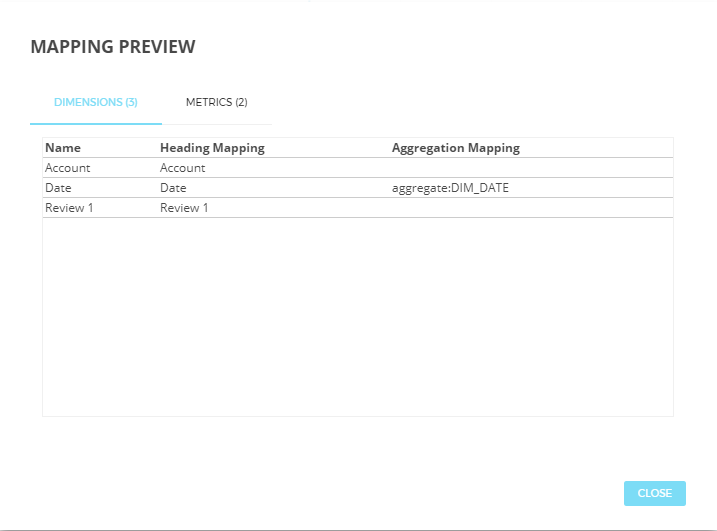 Edit Mapping - will take you back to the "Setup>Datasources>Edit Mapping>Selected Mapping", where you will be able to make any necessary changes. Clicking "Cancel" or "Save" will take you back to the template editor. 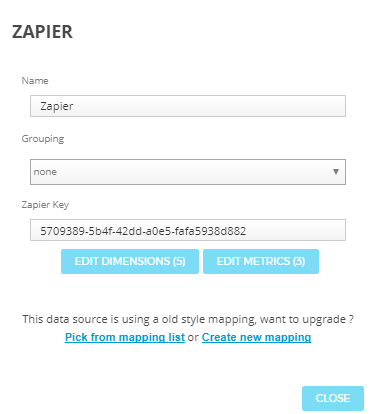 NOTE: Any changes made to the mapping will update every template and widget that uses that mapping. After selecting the mapping, you will then be able to choose the dimensions and metrics just like with any other datasource. 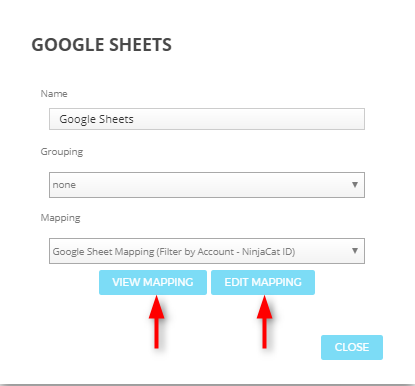 When adding a brand new google sheet mapping you will need to name the mapping, select the spreadsheet and specify the sheet you would like to use as well as choose if you will be filtering by an account column. If you choose to specify by an account column you can then choose the account id which you will be filtering by (Account Name, Ninjacat ID, External ID, and Specify at the Account Level). NOTE: Only mappings in which you select "Specify at the account level" will appear as available mappings at the advertiser network level. This also means that if you do not "specify at the account level" than any account that you choose in the template editor will display data. You will then need to create the dimensions and metrics just as was previously done within the template editor except now using this new UI. 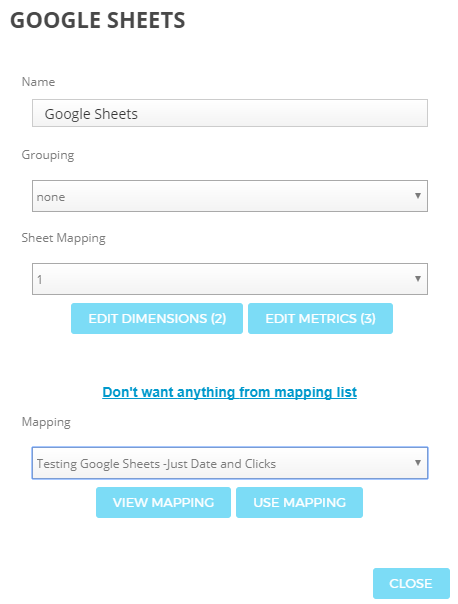 You will only be able to save your mapping once all three tabs are filled out. All existing google sheet widgets will work as before when reports are run and within the template editor. Only those accounts that were meant to show the data will render the data within the template editor. For example if Advertiser "Coca Cola" was set up with the google sheet advertiser network, than within the template editor only "Coca Cola" account will show data and any other account will come back with the message "No data was returned. The requested google sheet definition cannot be found." You will be able to "Edit Dimensions" or "Edit Metrics", which will allow you to edit, add or delete to this existing widget which will ONLY impact this specific widget. 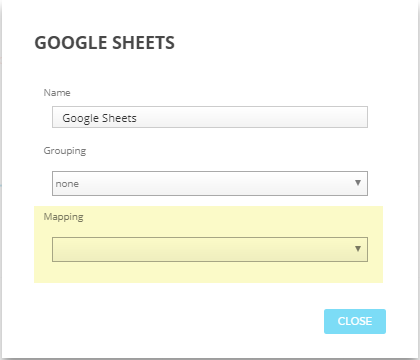 Selecting "create new mapping", you are able to choose to which google sheet network your mapping will be created in. Upon clicking "Go" all of the dimensions and metrics that were in that widget will appear already there which you will be able to edit, remove and create additional if need be. Here you will need to name the mapping, select a spreadsheet and sheet and choose whether it will be filtered by account. Upon clicking on "save" you will be brought back to the template editor where your mapping will appear in the dropdown which you can choose to use by clicking on "Use Mapping" or choose another mapping from the list or not use anyone at all. If you choose to use this new mapping in which you have created, you will be brought to the new state in which the "edit dimensions" and "edit metrics" buttons will disappear. Note: All previous advertiser networks that were set up, will no longer appear within the command center>data sources widget. Only those advertiser networks that were filtering by an account id will remain.